"Lothal is just as important to our Empire as any world in the galaxy." The battles of the Galactic Civil War have overwhelmed countless systems, sweeping away the memory of peace with the specter of the Empire’s tyranny. Yet the flame of hope is kindling to life, fanned into flame by the growing Rebel Alliance and teams like the Specters of Lothal. Now, you can take your Imperial Assault skirmishes to the birthplace of rebellion with the Lothal Wastes Skirmish Map, now available for order at your local retailer! When your skirmishes take you back to Lothal—perhaps with the recently released Tyrants of Lothal expansion and its associated Ally Packs and Villain Packs—you’ll be able to play out your battles in style with the Lothal Wastes Skirmish Map. This 26” by 26”, slip-resistant game mat is perfect for your skirmish battles, with the entire map boldly printed on its surface and plenty of space around the outside for your cards, tokens, and defeated miniatures. 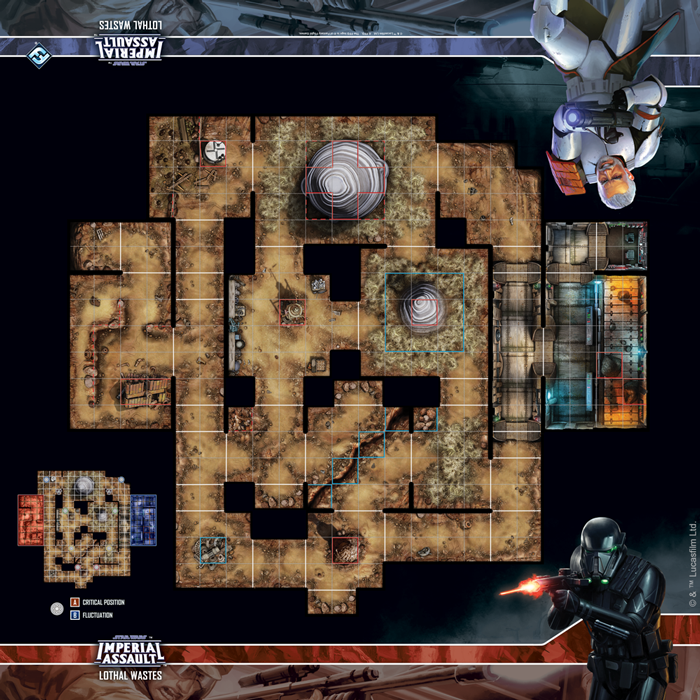 With a skirmish map like this at your fingertips, setup never takes more than seconds, and the two included Skirmish cards make it even easier to find the rules of your mission! Combine that with gripping art of a menacing death trooper and a grizzled clone warrior to draw you into the Star Wars galaxy, and it’s clear that there’s no better way to battle for the future of Lothal than with this skirmish map. You can order your own copy of the Lothal Wastes Skirmish Map (SWI60) at your local retailer today!